Tamil Nadu is a South Indian state also referred as the Land of Tamils. It is bordered by Puducherry, Andhra Pradesh, Kerala & Karnataka states. It is one of the most literate states of India. The literacy rate of this state is 84%, as per the census 2011. Students from different states come here to pursue higher education. There are several engineering colleges like IIT’s, NIT’s are located in Tamil Nadu state which offer quality education in engineering & technology field. 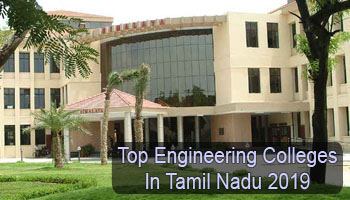 Here we are providing a list of Top Engineering Colleges in Tamil Nadu 2019. At Sarvgyan.com, we are presenting a list of top engineering colleges in Tamil Nadu for the session 2019-20. This list comprises of Indian Institute of Technology (IIT) – Madras, National Institute of Technology (NIT) – Tiruchirapalli and other government and private engineering colleges of Tamil Nadu. Various colleges and institutions of Tamil Nadu have been rated on different factors. Some factors which have been considered for rating are academic excellence, national importance, college affiliation and approval, placement records, quality education, infrastructure & facilities provided by the colleges, etc. Students looking for admission in UG engineering (B.Tech) courses in this state can get admission through TNEA (Tamil Nadu Engineering Admissions) or JEE Main (national level exam). JEE Main exam is regulated by the NTA board for providing admission in B.Tech & B.Arch courses. For admission in M.Tech course, students must have qualified the GATE exam. Students can also apply through SRMJEEE, VITEEE & AEEE (university level exams) for admission in B.Tech courses. Engineering courses are offered in different specializations. Some top specializations are Civil Engineering, Computer Science & Engineering, Chemical Engineering, Electrical & Electronics Engineering, Aerospace Engineering, Mechanical Engineering, etc. For any other queries about Top Engineering Colleges in Tamil Nadu 2019, you can leave your queries in the comment box given below. I wanted to know the best Engineering Colleges in Chennai and Tamil Nadu, both Autonomous,Deemed Universities and under Anna University. My cut-off is 169.25 in HSC.can you suggest some best engineering colleges in ECE branch in tamilnadu affiliated to anna university. MY Daughter got 172.5 cutoff so will she get seats in top 10 engineering colleges. I scored 106 marks in NATA. Uploaded marks in KEAM. How I can apply for colleges? Whether I have to apply individually or is there any rank list yet to publish.Kindly help.. The rank will be published. PSG college of technology is established in 1951 and as you mentioned it is not in 1999.
what is the rating of the college thiagarajar college of engineering, Madurai? Kumaraguru college , coimbatore…what is the ranking.